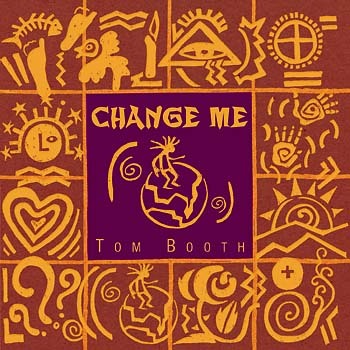 This collection of contemporary songs from Tom Booth is about change: the change we experience when we encounter the living God. It starts with a steady, electric bass and drums, then weaves a haunting, distorted guitar with a fierce rap about the mysteries of our faith. Then come samples of someone speaking slowly, with a heavy accent: "You young people, ask yourselves: Do I believe these words of Jesus in the Gospel?" Suddenly, as you tap your foot to the intoxicating rhythm, you realize it's the Holy Father, Pope John Paul II. Only Tom Booth could pull this off. This is only the beginning of "Taste of Heaven," the Unity-Award-winning rock epic that anchors Tom's album. In the creation of Change Me, Tom was inspired by meditations upon the conversion process, which starts with an encounter with God then moves to this courageous prayer: "Change me, Lord." "Ultimately, the call to change is the call to love. Like Mary," he says, "May we say 'yes' and be changed." This beautifully packaged disc features 13 original songs that alternate exhilarating rock and soulful blues with alt-country - marked by slide guitar - and reflective ballads. One of many highlights is "My Lady," which closes the album the way the Church closes her night prayers, with petitions and veneration to Mary. It starts with a steady, electric bass and drums, then weaves a haunting, distorted guitar with a fierce rap about the mysteries of our faith. Then come samples of someone speaking slowly, with a heavy accent: "You young people, ask yourselves: Do I believe these words of Jesus in the Gospel?" Suddenly, as you tap your foot to the intoxicating rhythm, you realize it''s the Holy Father, Pope John Paul II. Only Tom Booth could pull this off. This is only the beginning of "Taste of Heaven," the Unity-Award-winning rock epic that anchors Tom''s album. In the creation of Change Me, Tom was inspired by meditations upon the conversion process, which starts with an encounter with God then moves to this courageous prayer: "Change me, Lord." "Ultimately, the call to change is the call to love. Like Mary," he says, "May we say ''yes'' and be changed." It starts with a steady, electric bass and drums, then weaves a haunting, distorted guitar with a fierce rap about the mysteries of our faith. Then comes a voice, speaking slowly, with a heavy accent: “You young people, ask yourselves: Do I believe these words of Jesus in the Gospel?” Suddenly, as you tap your foot to the intoxicating rhythm, you realize it’s the Holy Father, Pope John Paul II. Only Tom Booth could pull this off. This beautifully packaged disc features 13 original songs that alternate between exhilarating rock and soulful blues with alt-country marked by the slide guitar and reflective ballads. One of many highlights is “My Lady,” which closes the album the way the Church closes her night prayers, with petitions and veneration to Mary.